This blog will explain about how to add a custom content in a Receipt which will be generated from MPOS in Microsoft Dynamics. Microsoft provides us with certain fields which can be put into the receipt. There are certain fields which a client will ask to show in the receipt. If the desired field is not available in the standard receipt designer, we have to customize it. This document will explain about how to add the custom field in AX and then pushing it to the channel DB and then binding it in MPOS code. You can add custom fields in AX and bind it in the code in Modern POS. 1. Add Custom Fields in AX. This process is same as we used to do for Enterprise POS. Lets take example of adding barcodes for the items in the receipt. Go to Retail>Setup>LanguageText>Click New>Add Barcode. Above screenshot contains the information about how to add the language text before adding Custom field in AX. Now go to Retail>Setup>Custom Fields>Add Barcode. Select Type as Receipt. Above screenshot is about adding the Custom fields in AX. 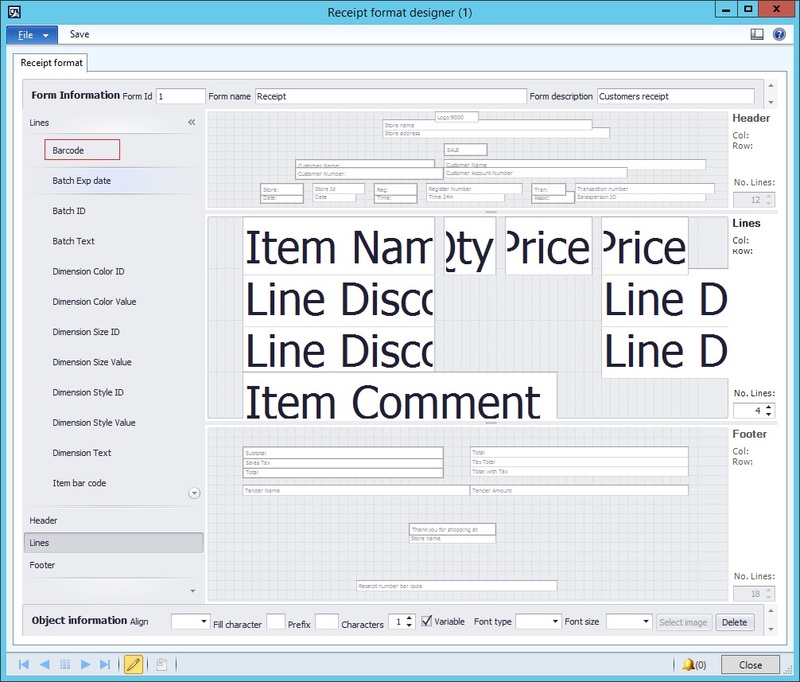 Add Barcode in the Lines Section of the Receipt designer. Above screenshot shows the customized barcode control on the right side. This should be selected and placed at lines section of the receipt. After placing the control at desired location, save the receipt. Now run job 1090 from distribution schedule. This will Push the customized receipt to the Channel DB. 2. Now We will look upon the Retail SDK. 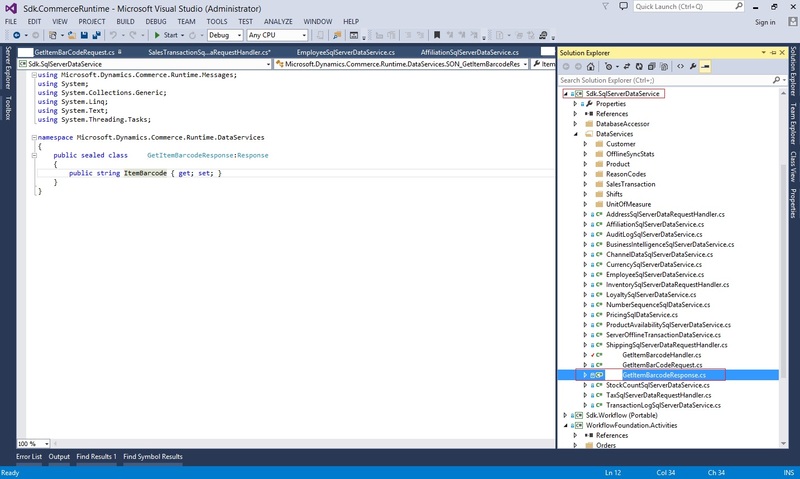 Open the sdk.SqlserverDataservice project and add classes. Above screenshot is the request class which is created to handle the request in CRT. Above screenshot is the response class which is created to handle the response in CRT. 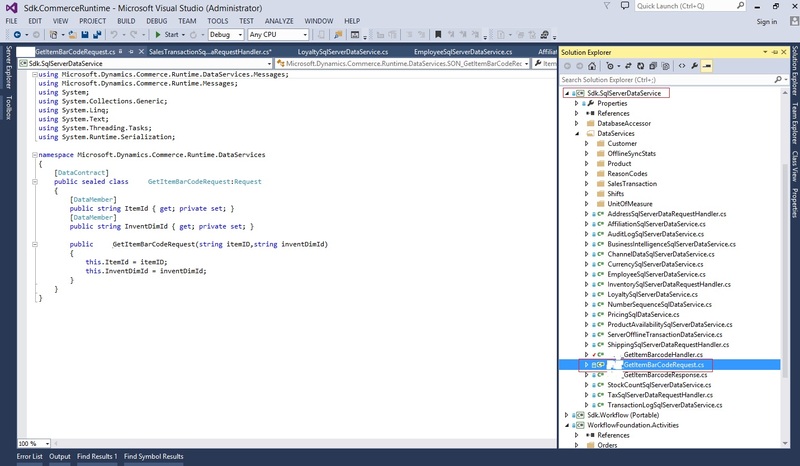 After putting the code in the respective class, build the dll and update in the bin folder of the retail server. This will help in exposing the code in the services project. Now Come to the sdk.services project and open Receipt folder. There is a class called ReceiptService.cs inside the folder. Build the project and put the dlls in the retail server bin folder and Run MPOS. Please make sure that the dlls are placed properly. 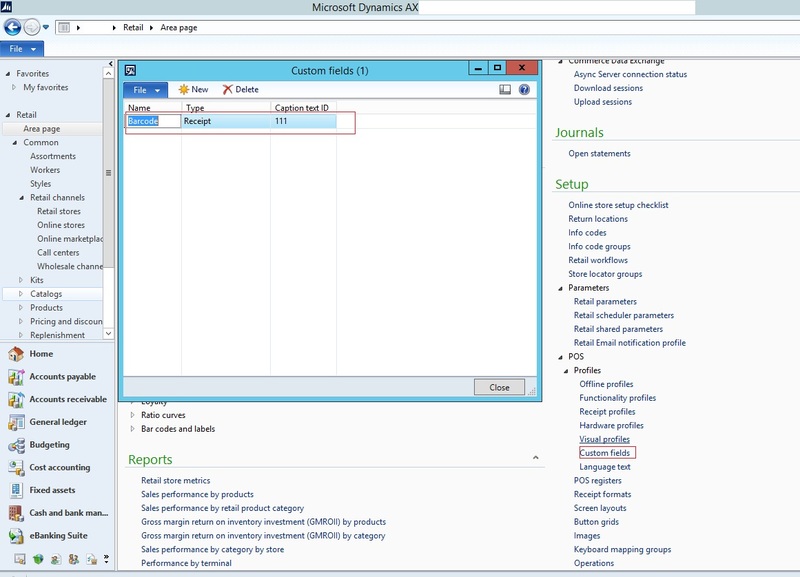 If the dlls are not placed properly then customization will not be available. Barcode shown in the Receipt. 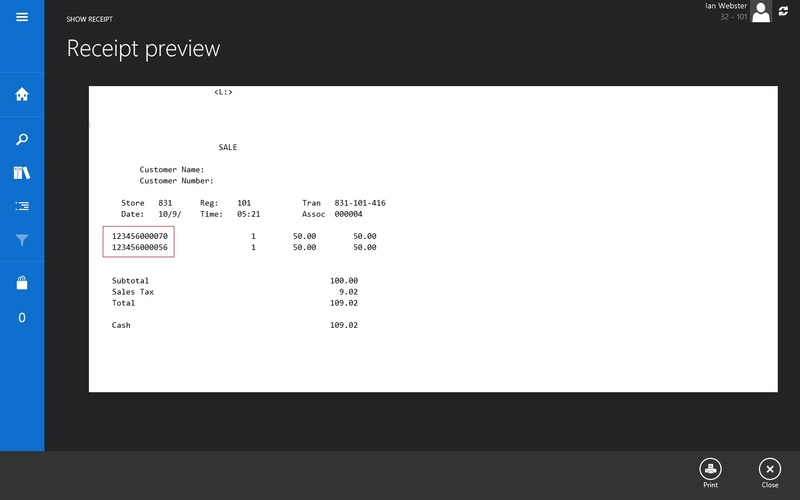 The document helps you in showing any custom field on the receipt. There are certain fields which are available in the Receipt toolbox but still does not contain the implementation. With the help of this document, developer can achieve the results. If you have not understood any point discussed in this post, ask our dynamics AX consultants in comments. They will answer you shortly. This information is very usefull for us. We are trying the same for Cloud POS. We have added the custom field but the custom field doesnot show up on our Receipt. Can you help us on this? ?